A beautiful warm, sunny day with blue skies welcomed the team and spectators alike to the Nurburgring, with a blazing sun lighting up the lush green wooded hills that surround the circuit. For petrolheads, this is a very spectacular and atmospheric place indeed, a venue truly steeped in motorsport history. In driveways outside the prim houses of the villages all around the circuit sit road cars with roll-cages, many with numbers, wings, lowered suspension and who-knows-what kind of other trickery lurking beneath the bodywork. For the locals round this pocket of the Eifel, pounding the Nordschleife seems to be a part of daily life - as does systematically improving their cars to chip away at their best lap times. For Team LNT, the desire was similar – to chip away at the lap times and make improvements to the car. In the team’s hands, the Panoz Esperante GTLM has already achieved excellent pace and reliability: nobody can argue with June’s class win at Le Mans after all. Did being Le Mans victors change anything at all about the feeling of going racing for the team – the pressure, the approach, the tactics? Practice was split into two ninety minute sessions – the first at 9 o’clock on Saturday morning. Lawrence Tomlinson took the Le Mans winning car out first, whilst Warren Hughes was first to drop into the snug seat of the sister #81 car. Warren Hughes was back in after only one lap though. “I’d only been past the pits once when I got an oil alarm so I had to bring it in as we need to be sure if it’s a real problem or just a sensor.” The crew went to work straight away, removing the front bodywork to gain speedy access to the engine, which is certainly an advantage the Panoz has over some of its competitors. The problem was traced to a seized oil pressure relief valve and Hughes was sent back out into the fray. Meanwhile, Lawrence Tomlinson had handed over to Richard Dean, who would have the lion’s share of the first session. He placed #82 sixth fastest in class early on with a 2:04.463, then went third with a 2:03.009, and on to a best time of 2:02.454, which kept the Panoz in the top five for most of the session. With thirty minutes to go Hughes was unleashed on a flier, or so it seemed – his 2:01.700 was just five one-thousandths of a second slower than the leading Spyker. “That’s quick,” said a smiling Lawrence Tomlinson as he studied the screens, “tell him to slow down!” he joked to the crew. With ten minutes to go, both Esperantes were parked outside the garage. Dean handed over to Marc Hynes, who had a steady couple of quick laps and Hughes changed over to Rob Bell. “Pretty encouraging for a first session,” was Lawrence Tomlinson’s summary, despite some late improvements for other cars dropping #81 to fifth and #82 to eighth by the end. 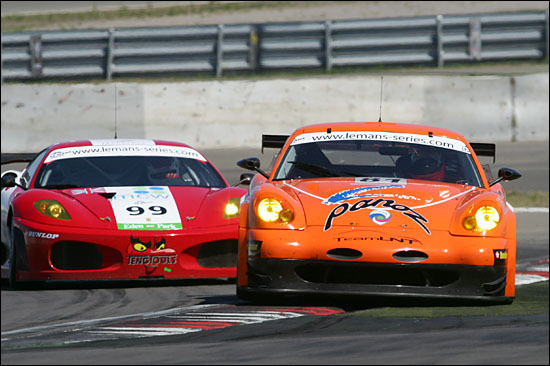 The most significant of those improvements were the #99 Virgo Ferrari 430 in the hands of Tim Sugden and the #76 Porsche of Marc Lieb. The feeling was that those two may well prove to be the ultimate pace-setters over a single hot lap, but over the course of a 1000km race those hot lap times did not concern Team LNT. They didn’t win Le Mans by their qualifying pace, let alone practice times. The second session started at 1 PM in much the same conditions: it was warmer but a constant breeze had kept the temperatures from soaring too high. By the end of the session three cars had gone below the 2:01 barrier – both GPC Ferrari 360s and the #90 Farnbacher Porsche. Rob Bell certainly hoped to join them in qualifying, he was only two-tenths of a second off after all. The 20 minute session, exclusively for the GT1 and GT2 cars, took place on Saturday afternoon in more of the same bright, hot weather. Dean and Bell were the chosen ones and were bestowed with qualifying duties. Both of them were right on it from the green flag. Dean set a 2:01.830 but Bell’s opening effort was even better, raising the dust as he smeared the huge Pirellis over practically every inch of every exit kerb around the track. 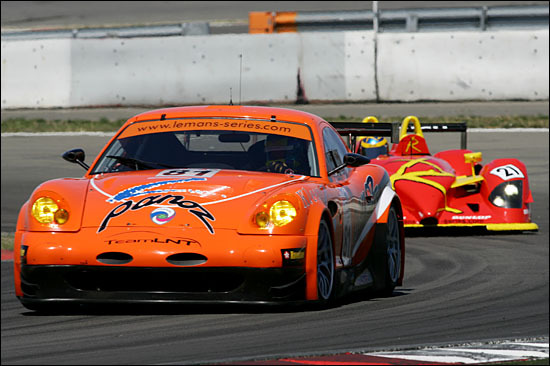 A Panoz 1-2 would of course be perfect, but alas the dream was short-lived. The Porsches of Lieb and Bergmeister split the two Esperantes and then the Ferrari invasion began. Bell improved his time to an excellent 2:00.105 and then pitted, defenceless as GPC’s 430s went on to take the two top spots – bt only just. Richard Dean was still out there searching for that elusive baulk-free lap, then it all started to come together for him. Two green sectors were showing on the timing screen, meaning that he had bettered his previous time in both. If he hooked the final sector up then his time would improve and in all likelihood so would his position, because the class was so tight at the top. But it was not to be, as he explains. 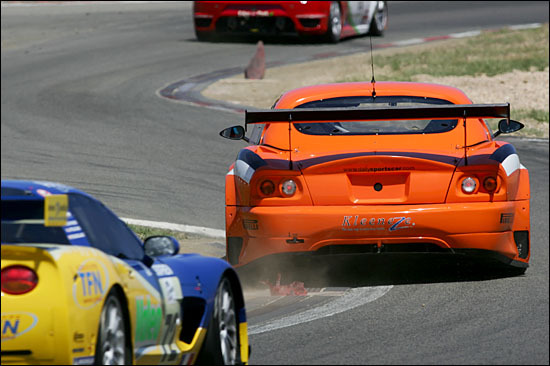 “I came into the chicane behind the GT1 Ferrari and he almost stopped in front of me. He braked and braked again and I had absolutely nowhere to go. I was on a quick one and whilst you can avoid these things by being cautious, if you are over-cautions all the time then you’ll never get anywhere. What makes his actions worse is that two laps earlier I saw him flashing his lights from three corners back so I let him have the line and go through. He pushed on the next lap too, so I thought ‘that is good, he should pull away from me.’ On the next lap, my quick one, I remained about six car lengths behind all the way round until he obviously decided to abandon his lap completely. 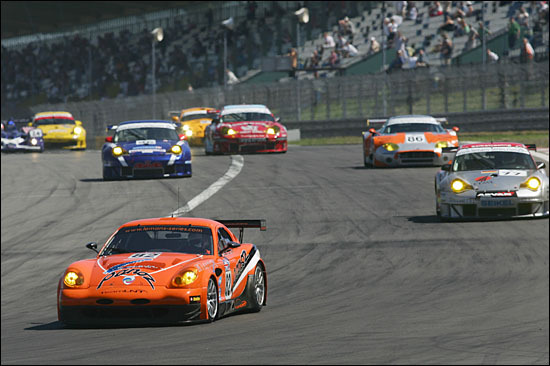 He nearly stopped and they [the GT1 cars] can stop a lot quicker than we can. I’m annoyed about the grid position and also damaging the car when it was avoidable.” Fortunately the damage to the car was relatively minor, but the damage to the grid position consequently caused was far worse – twelfth place. Tomlinson and Hughes were on warm-up duties on Sunday morning. It was an early start at 8:40 AM but when a day dawns as beautiful as it did on Sunday, what better way could there be to start it? Just before midday the field of 44 cars took to the circuit ready for the rolling start. 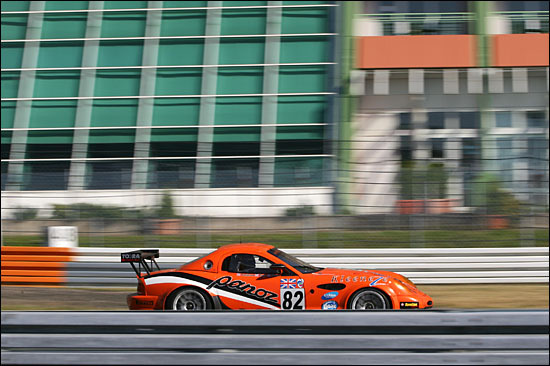 Warren Hughes took the start from third place in class in #81 and Richard Dean was on-board #82, further back in 12th. Hughes initially ran as the best non-Ferrari, maintaining Bell’s qualifying position and sandwiched between the second-placed GPC 430 of Drudi and Sugden’s similar Virgo car. Up ahead Hughes was also keeping a watching brief on the GPC Ferraris, but he also had his work cut out defending advances from Sugden’s Ferrari, just half a second behind. By lap nine Bouchut and Dean had moved up to sixth and seventh, then Dean passed Bouchut so both Team LNT cars were in the top six within the first twenty minutes of the six hour race. This was great stuff from both drivers. The order was Belicchi, Drudi, Hughes, Sugden, Camathias, Dean and Bouchut. As the crew began work on the newly arrived #81, Dean radioed in from #82 to say he had been hit by a Ferrari. 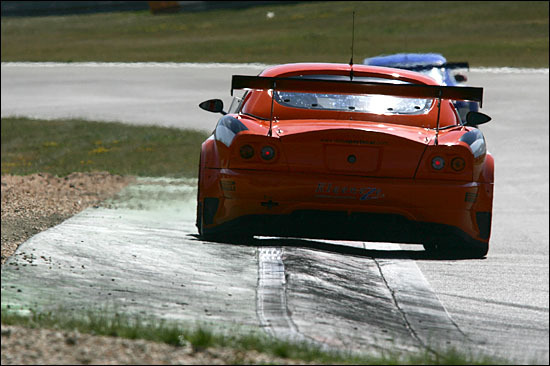 The team later realised it was actually a GT1 Aston Martin that had made contact. Dean struggled to rejoin the tarmac but was thankfully up to speed again quickly. It was a bitter double whammy though, after an excellent early performance from both drivers. Hughes rejoined in 40th place, 17th in class and laps down on the opposition. Dean was soon climbing the order again, up to 34th, and 11th in class but with a gap of over 30 seconds, he was a long way behind Kane’s Spyker. “Right, we’ll start again then,” muttered Tomlinson. If only that were an option. It was clearly going to be an uphill struggle for both cars now. With just over an hour gone Belicchi, Drudi and Sugden led out a dream for Ferrari, followed by Camathias, Seefried, Bouchut, Bleekemolen, Beltoise, Ehret, and Kane - before the first of the LNT cars. Dean led Washington, Duez, Burgess, the sole TVR and Basseng then it was Hughes. #81 was two laps behind anyone else though, and with a further two laps in hand over the recovering Simonsen it had turned into a lonely opening stint for Warren Hughes, though he had to maintain the pace to maximise the chance of taking advantage of any misfortune elsewhere in the field. The first round of pitstops started around the one-hour mark and this saw Dean move up to a high-point of fourth in class, before he pitted himself to hand over to Hynes. 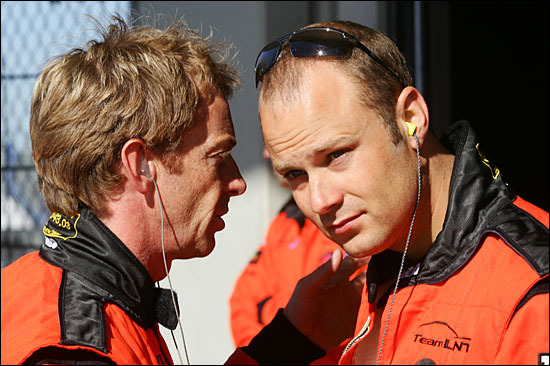 Hynes began his first stint with the focus of passing Crevels’ Syker, having instantly made short work of Nigel Smith’s Porsche. After the first round of stops the order in GT2 was De Simone, Cioci, Lieb, Eagling, Bouchut, Hezemans, Duez, Crevels, Hynes, Smith, Ehret, Liddell, Daniels, Dockerill, Collin and then Hughes, a lap down on Collin and out of sequence with the others due to the earlier stop. The two Farnbacher cars were the next to hit problems. #90 spent some time in the garage before re-emerging between the two Esperantes, now with Farnbacher at the wheel. One place gained for Hynes. Bell also made up a place as the #80 car was pushed into the garage, where its race ended. . When Hughes handed #81 over to Bell they dropped back behind the recovering Simonsen, but the Autorlando car came in shortly afterwards for repairs to the right front after a blow out removed the entire wing. 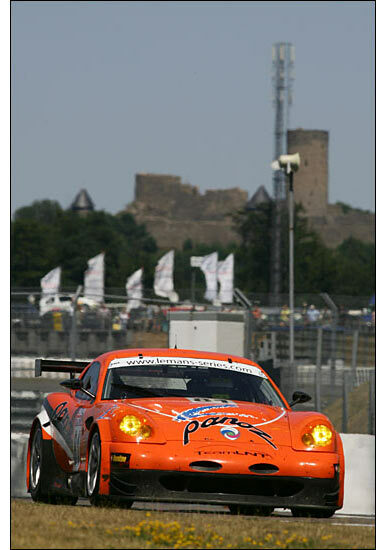 Bell was now in pursuit of Daniels, and the vital statistics were that the James Watt Automotive Porsche was 2 laps ahead, but 16 seconds a lap slower. Before the start of the race Bell said he felt a “need to get the car to the finish today. The team have worked really hard this week, in fact since Le Mans as both cars have needed a rebuild, so it would be nice to give them all some champagne to drink.” Chasing the likes of the Daniels Porsche in sixteenth place was certainly not what he had envisaged. Once that sequence of stops had shaken the order out again, Tomlinson was running seventh behind Camathias, Zonca, Bleekemolen, Narac, Sugden and Kane ahead. There was drama at the front when the class-leading De Simone Ferrari made contact with Crevels’ Spyker whilst lapping him and lost the lead, and a position to the Panoz whilst pitting to hand over to Drudi. Drudi was straight out onto a recovery drive and moved past the Panoz with 92 laps completed, so the Panoz fell back to eighth. Hughes was still on a charge. He finished off Bell’s job of catching Daniels in the James Watt Automotive Porsche by passing Washington, who had taken it over. He was still separated from Tomlinson by Hesnault, Ehret, Yamagishi, Lefort, Bergmeister and Hartshorne. It was a one minute climb to the TVR, but with a gulf in their respective paces, five laps later the gap was only 14 seconds and Hughes moved past easily within a couple more laps. 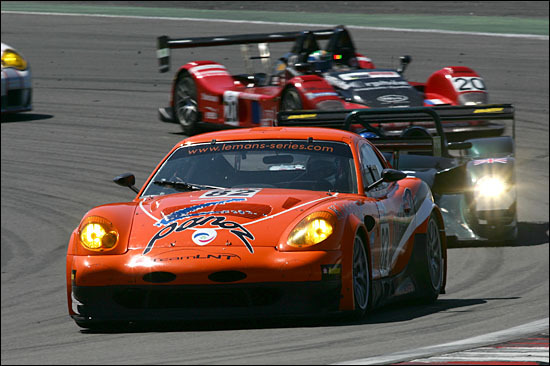 With Hartshorne dismissed, Lefort and Bergmeister were next, but they were a full lap ahead of the Panoz, with Bergmeister lapping only a second or so slower than the charging Hughes. The Safety Car made its sole appearance with around two-thirds of the race already run. This was to allow for the safe recovery of the Thierry Perrier Porsche that had flown into a gravel trap after losing a wheel and seemingly ripping itself to pieces. 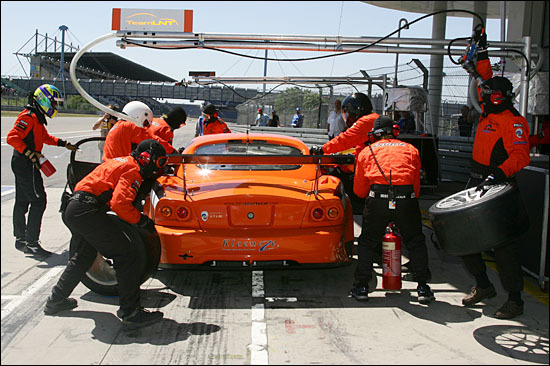 The crew on the pitwall made the vital call for Tomlinson to pit and hand over to Richard Dean, as far less time is lost if the pitstop is carried out whilst everyone circulates behind the Safety Car. GPC made the most of it as Camathias had handed over to Lieb just before the Safety Car. The lead two had been only seconds apart, but now the Ferrari had a one lap cushion and it was enough to ensure the victory. As the Safety Car peeled back off the circuit, most of the gaps between cars had been crushed. Cioci led Lieb, with Hezemans 17 seconds behind. Just a further ten seconds back were Eagling and Crevels, now disputing the same piece of tarmac. Dean should have been right with this pair and looking to take a relatively easy fourth before chasing down the Hezemans Spyker for third. 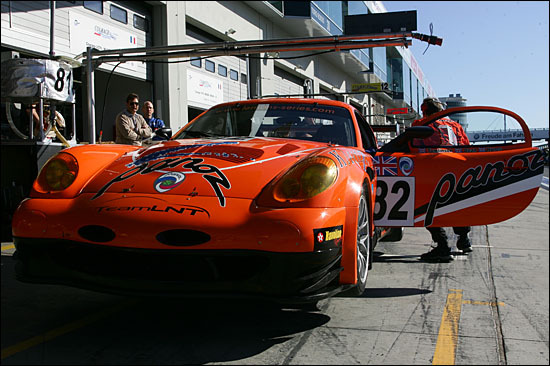 Unfortunately, hot starting problems had cost him time as he tried to rejoin at the start of his stint and in fact Narac had made it past Dean and led the Panoz by 3 seconds. Both men were realistically already out of touch with the lead five. With only 1 hour and 45 minutes to go, it wasn’t looking good for either car. A finish was the best to be hoped for in the #81 camp, whilst increasing the points haul was the aim for #82. As Dean closed in on Narac he set the best lap of the race so far for his car. That sixth place was a real incentive and he took it with a clean move. With the other five a lap ahead (two laps for the lead duo) sixth was as good as it was going to get unless problems struck. And indeed it was, the IMSA Matmut Porsche was too far down the road for Hynes to catch it by the finish. So the result for Team LNT was two cars home, but not in happy circumstances. After the race, Dean reflected “You can’t afford to get involved in someone else’s incidents, its just one of those races when we’ve not been in a position to take advantage of other’s misfortune, as not many people were having any! “The result is disappointing after you look at the weekend up to the race itself and the pace of both cars in the race. The problem is that people remember the bits that went wrong rather than the good bits, but the fact is we were more competitive than we have been so far. Lawrence Tomlinson also easily found the positives to take from the weekend. 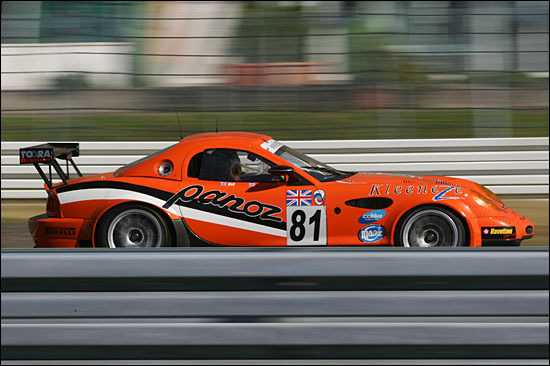 “For long stints of the race the Panoz was the fastest car on the track in class and we were so close to pole in qualifying. The pace is there, it’s a shame that it’s the fastest we’ve ever run in a race and yet it has given us the worst result. The reality is that there were plenty of positives from the weekend even if the result and the points haul was the worst yet for Team LNT. When the pack regroups at Donington Park for the penultimate round, LNT will be looking to make their home advantage count, particularly as Richard Dean’s rough and ready post-race calculations suggest that he and Lawrence Tomlinson are still second in the championship. It could go down to the wire at Jarama for the final round, but Team LNT is sure to be fighting all the way.